The Glendalough Hotel will be our base for the weekend. 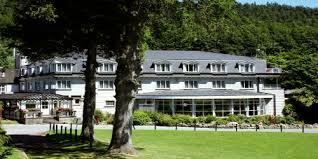 The Glendalough Hotel is located in a picturesque wooded valley situated in the heart of the Glendalough Valley, in Wicklow the “Garden of Ireland” amongst the natural greenery, mature forests and tumbling waters of the Wicklow countryside. Accommodation are to be booked directly through the The Glendalough Hotel +353 404 45135. The IMC Hut is located in Glendasan, Glendalough, Co. Wicklow, in the heart of the Wicklow mountains and within walking distance to Glendalough Hotel. It provides basic rustic self-catering accommodation. The IMC is happy to share it with outside individuals and groups involved in mountaineering and related activities. For bookings please contact the hut warden at hut@irishmountaineeringclub.org and state that you are an MI member and attending the Women With Altitude event. Camping option also available.